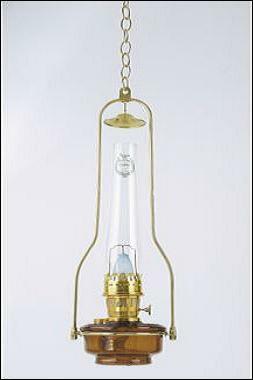 Our Deluxe Glass Hanging Lamp brings a disctinctive touch of country charm to any home. 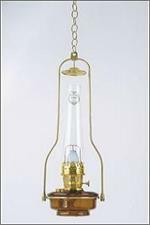 With its stylish stippled-finish brown tinted glass bowl, solid brass frame, this lamp fits easily into any early American decor. The disctinctive tilt frame hanger makes it easy to remove for refilling. The warm, friendly glow from this Aladdin lamp will provide countless nighttime hoursof tranquillity, reminiscent of a more peaceful, simple time. Lamp can double as a shelf or table lamp. 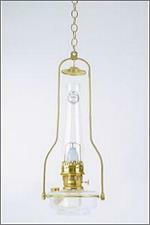 24" overall height (plus 18" brass chain included), 7" lamp base diameter, 1 quart kerosene capacity. 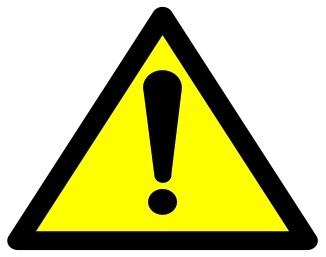 This lamp needs a minimum clearance of 12" from the top of the chimney to the ceiling. 1940s styling in a hanging lamp style with beautiful brown glass font. 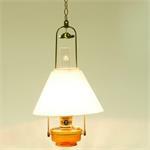 Complete antique or farmhouse style hanging lamp, just add kerosene.